The following incidents are collected from previous holiday postings...enjoy! One morning last week, I noticed that the ornament had fallen from the tree and was laying on the carpet. The string that attached it to the tree branch was not tore and felt fortunate that it had not broken. I just placed it back on the tree. That night, I was laying in bed asleep (around 11:45 pm) when I thought I heard heavy footsteps coming down my upstairs hallways towards my bedroom. I got up, looked around the house and rechecked the intruder alarm. I was in the kitchen checking the outside door when I heard footsteps rapidly going up the stairs to the second floor. I live alone, so I was very concerned, so I called 911 just to be safe. The police looked around the property to make sure it was safe. I live in a small community where everyone knows everyone else's business, so anything out of the ordinary is common knowledge the next day. The police assured me that they would not make a report. They soon left and told me to call back if I noticed anything unusual. I thought that was an odd statement but I appreciated their concern. 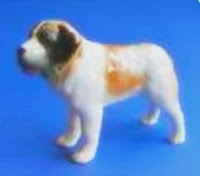 It has been almost a week and the St. Bernard ornament is still missing, but there has been no further activity since it disappeared. I cannot explain any of this. Are you familiar with this type of activity? I hesitate to speculate what is going on and really don't what anybody coming into my house to investigate. If the ornament returns, I will notify you. Please feel free to publish my story if you like but I would appreciate anonymity. I have included a photo of a similar ornament I found in a dealer catalog. Thank you for your help. by Mark Leyner - Can an innocent Christmas present plunge a normal family into consensual madness? Yes, it can, especially if the catalyst is a three-foot My Size Barbie, the first exceedingly popular toy that my daughter, Gaby, ever asked for insistently. Her obsession meant I ended up in some remote Toys “R” Us in another state! one Christmas Eve about ten years ago, vying with other desperately doting dads for the last few items on well-looted shelves. But I managed to bag my first Big Gift. The next morning, Gaby exuberantly unwrapped the My Size Barbie, immediately and inexplicably christening the doll Jessica Lynn Cohen. Why that oddly specific appellation, with its country-western triple cadence, we’ll never know. It was Christmas, and it was her doll, and it stuck. Gaby and Jessica Lynn Cohen became instant BFFs. Gaby lent Jessica Lynn Cohen her clothes, they played school, hosted tea parties, went to the park, sat on the stoop together, reenacted scenes from Disney movies. But then came the inevitable cooling off. Kids tire of gifts. And they abruptly and blithely cast them into oblivion. No big deal. We put Jessica Lynn Cohen in the basement, in a spare room we use as a catchall storage space. In the beginning, we’d each move her around just to scare one another. But then she seemed to move around on her own. She’d appear in various rooms without anyone having touched her - or at least without anyone admitting to having touched her. I’d go downstairs to attend to a blown fuse and there’d be Jessica Lynn Cohen in the boiler room. We’d find her in the pantry with her arms outstretched in a sort of pious Joan of Arc gesture of supplication or in the bathroom with one leg raised high over her head like a Folies Bergère dancer. Coming upon her this way could be frightening. She had taken on the stricken phantasmal look of a ghost from a shipwreck. She also started terrifying other people. I could always tell by the ashen face of some poor plumber or cable guy that he had accidentally stumbled upon Jessica Lynn Cohen in a dark corner of the house. So we decided to get rid of her. But very bad things happened to us whenever we tried to throw her out. Within hours of the first time I left her out on the street for the garbage men, my wife, Mercedes, who’d never had a single related symptom, had a severe gallstone attack and needed to be rushed to the emergency room. I reluctantly brought Jessica Lynn Cohen back inside. A couple of months later, I was hit by a car as I crossed a street in Culver City, California. At the moment of impact, I did not have that common experience of seeing my life passing before my eyes; I had the unmistakable feeling that Jessica Lynn Cohen was angry. I called Mercedes and asked if anything unusual had occurred in the days preceding my accident. She admitted that she’d taken Jessica Lynn Cohen to the Salvation Army. Get her back, I said. We tried finding a new home for her. A friend - a single guy without kids - finally agreed to take her in. Within two weeks, he’d developed a pilonidal cyst and his brother in Florida was arrested for embezzlement. Our friend returned her and asked that we never again discuss her in his presence. We eventually had to reach an accommodation with Jessica Lynn Cohen and accept her as a permanent member of our family. She is now the unrivaled centerpiece of our Christmas tradition. On Christmas Eve we keep her in a special “secret detention room.” We worry that Santa, because of his facility for seeing into the souls of all things, might discern in Jessica Lynn Cohen something irredeemably bad, and be frightened off before he has a chance to deliver our presents. But on Christmas morning, there she stands, in her honored place of precedence, next to the tree. Yes, I suppose you could say she’s an evil zombie doll who led our family to madness. But, damn it, she’s our evil zombie doll. We adore her. And we’re never, ever going to abandon her. 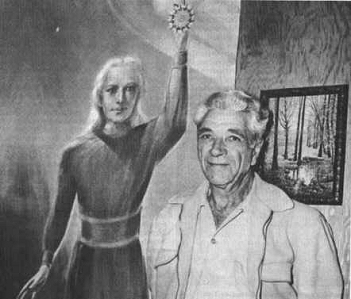 George Adamski was a Polish-born American citizen who became widely known in ufology circles, and to some degree in popular culture, after he claimed to have photographed ships from other planets, met with friendly Nordic alien "Space Brothers", and to have taken flights with them. 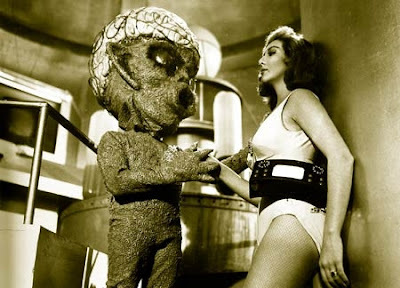 The first of the so-called contactees of the 1950s, he styled himself to be a "philosopher, teacher, student and saucer researcher." Adamski claimed that he had been contacted by the Venusian occupant of a flying saucer that landed in the California desert November 20, 1952. Subsequently Adamski claimed to have had contact with spacemen from Mars and Saturn and to have traveled 50,000 miles into space in their craft. After Adamski's revelations, the convention of spaceman contacts, messages from outer space, and warnings about the welfare of the cosmos became firmly established. “Attempting to establish a contact,” George Adamski and 6 others drove into the desert, and were eating lunch when a cigar shaped ship was seen hovering. This departed, but after they had driven half a mile and got out, there appeared a saucer hovering, which he photographed. Then he saw a man beckoning, 1/4 mile away, and Adamski walked up to him. He was wearing a one-piece brown coverall without seams, and had shoulder length hair and a very high forehead. Adamski asked him by signs what planet he came from; he replied by indicating the second orbit and speaking, “Venus,” as Adamski had done. “He made me understand that their coming was friendly,” and that, they were concerned about atomic explosions (nodding or shaking his head in response to Adamski’s questions accompanied by mental pictures) an extended partly telepathic conversation is recounted. The visitor indicated his feet; his shoes left footprints containing mysterious markings. He conducted Adamski to the saucer, but not into it, it was translucent and hovering close to the ground. Then he returned to it, and it took off. Adamski was apart from his companions for 1 hour, but they could watch by binoculars. At Palomar Gardens, where Adamski had set up his telescope, he was able to make 3 photographs of a saucer as it approached. It came within 100 ft; “one of the portholes was opened slightly, a hand was extended, and the film holder which my spaceman friend had carried away on November 20 was dropped to the ground.” When developed, it showed not the original saucer photo, but numerous mysterious blurry signs. Doreen Wilkinson reported that three invisible entities attacked and violated her in her home. Around the same time John Stuart was sitting at his desk when a bizarre entity appeared before him. 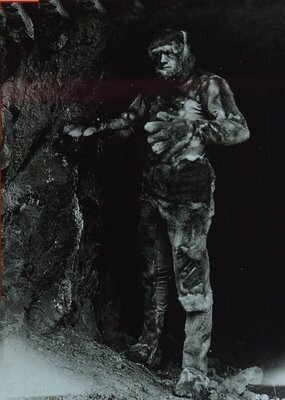 The humanoid was about four or five feet from him and was facing him. Its body resembled, vaguely that of a human. From the waist up it was a man and from the waist down that of a woman. It's flesh stinking putrid, seemed to hang in folds. It was grayish color. The slack mouth was dribbling, its lips moved but there was no sound. Stuart heard a telepathic message, “Your friend knew too much and had to be silenced.” Soon the creature seemed to waver and grow less distinct; then materialized again into solidity. Stuart almost collapsed in horror as he realized that the male & female areas of its body had changed places. He received one more warning before the creature dissolved and disappeared. Stuart soon abandoned Ufology. Wong Yi Moi, a young Chinese girl had been tapping rubber trees near the edge of a large estate not far from the Trolak River when suddenly she heard a rustle in the grass behind her. Before she could turn, she was seized by powerful arms, which were covered with dense, black hair. Struggling, she managed to look over her shoulder and found herself staring into a face that was straight out of a nightmare, with two long, blackened fangs jutting out from between thick lips. In a frenzy of horror, she saw two more ape-like creatures standing by the edge of the forest. Their skin appeared to be white beneath its covering of black hair, and their faces were distorted by fearsome grins. The two creatures by the trees were over six feet in height, and wore loincloths. Each carried a knife slung from the waist. The creature struggling with Wong Yi appeared to be a female. She wore a yellowish skirt made of bark and uttered weird, croaking cries. Finding additional strength the young Chinese girl succeeded in tearing herself free. As she fled, she snatched one terrified glance over her shoulder, but the creatures were moving away back into the forest. Two other people had also spotted the “fang men” along the banks of the Trolak River within hours of Wong Yi Moi’s experience. The first was a corporal in the Malaya Police, Abdul Talib, who had been on patrol with a security detachment. On seeing the three weird creatures on the opposite bank of the river, the corporal raised his rifle and all three-ape creatures dived into the river and swam out of sight. The second witness was an Indian rubber tapper named Appiasamy. Hairy arms too had grabbed him from behind. Breaking free he had run for his life only to fall headlong down a rocky slope, bruising himself badly. 14-year old Arvo was in the forest with his father collecting firewood. When it was getting to be twilight they headed home. Almost at once the boy noticed on the right side of the path, on a small rocky hill some 2-3 meters high, a strange device 3-4 meters in diameter. He assumed it was a moonshine factory and since he had never seen one before he wanted to have a look. His father however deterred him from approaching the object. He observed the device from a distance of about 70 meters. He described the device as being 3-4 meters in diameter, narrowing at the top, which was hidden by the dense firs. The bottom section was round like a kettle and it was about 2.5 meters in height, supported by perhaps three landing legs made of 2-3 rods ending in triangular plates, which he would observe later. From the bottom of the craft emanated a “dull” flame like that of an upside down candle, 1.5 meters long. From the sides of the lower section of the object shot out 5-6 strong flames of different colors angled at 45 degrees down and about 1 meter in length, emitting a loud noise resembling that of escaping gas. 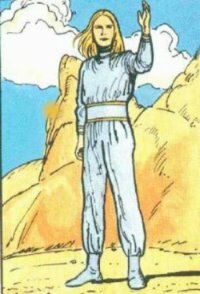 Standing outside the object was a 160cm tall human like creature, which was clad in an astronaut-like suit with a round helmet, which had an oval opening. It was carrying a box, which he was apparently using to “direct” 2 or 3 robot-like creatures, which had box-like heads. At least one of these robots lifted his legs very high when walking, so Arvo could see that the legs were like two rods below the knees ending in a plate. It was not possible to make a very accurate or detailed observation of their activities due to the twilight and covering trees. The next day the Winter War began, but Arvo went to the landing site, despite his father’s objections, which also refused to go fetch firewood with him. At the site where the object was seen there was a triangular mark of a support leg. There was also a strong, unpleasant smell in the area. On a frigid night as the whole family slept they were suddenly awakened by the keen howling and frenzied barking of their dogs. Several family members quickly rushed out after getting quickly dressed. The dogs acted as if they were rabid but never approached the figure of a strange man that was standing by the fence next to the road. He was not wearing proper clothing. With temperatures below 30, this figure wore a black tailed tuxedo and a white shirt. He stood there watching the dogs, and then he looked at the family. They walked towards him to see what he wanted but he backed up to the dirt road. Two of the men walked towards him. He watched them approach him and then walked backwards down the road. No matter how fast the men walked they could not get close to him. He seemed to be walking backward one step at the time but no matter how fast they ran they could not reach him. The men gave up and returned home. They never saw the stranger again.